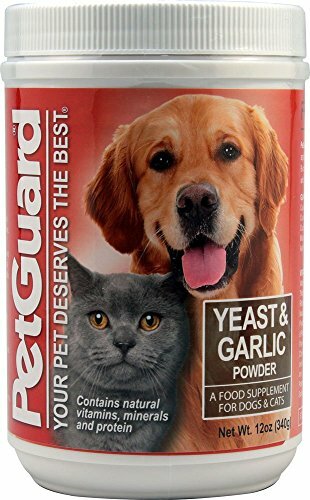 Pet Guard Yeast and Garlic Powder, sprinkled on your pet's food, and Yeast and Garlic Wafers, given as a treat or reward, will nourish and strengthen your pet naturally with protein and the essential B-Complex Vitamins. Used regularly, Yeast and Garlic will help your pet be healthier, happier, more disease resistant and less prone to problems associated with infestation. Our Yeast and Garlic products help your pet to maintain a healthy appetite and protect against anemia. Yeast and Garlic not only supplies B Vitamins but also is a valued source of trace minerals and B-Complex Vitamins. Protein and trace minerals are essential nutrients necessary for enhancing your pet's vitality and stamina and work to build your pet's natural immune system. If you have any questions about this product by PetGuard, contact us by completing and submitting the form below. If you are looking for a specif part number, please include it with your message.